Love In Any Genre is a romantic comedy that pays homage to the different film styles experienced by the director when growing up - Korean, Bollywood, French and Malaysian. The protagonist is Yazid, whose behavior and personality are influenced by the many films he watches. He cannot differentiate between reel and real life. He starts to want to discover his true self after meeting an aspiring actress, Amy. At first, she plays along with his antics but as feelings begin to grow, she finds the relationship may not work because of this. Is this a mental illness? Will Amy accept Yazid for whom he really is? Can Yazid realize that life is never like the movies? Will he change for the sake of Amy? The film was screened at the 3rd Singapore Short Film Awards last month, and we caught up with Suffian Zain to find out what his take on love is. What was the inspiration behind this script? What was your brush with "love" before the production of this short film? People inspire me. I have always been interested in how people approach life, how we are shaped to become who we are today and how our life experiences influence our actions and reactions. We have in us a huge mixture of emotions. Everyone will experience similar chapters of life in one way or another… like falling in love. There will be challenges, and no matter how things end, it is the journey that forms our memories and personalities. So it is always inspiring to create life journeys for my characters that the audience can relate to. I am also inspired to share bits and pieces of my life into my stories. Sometimes, it is nice to share things with people who go through the same experience as you. I have formed my own definition of love through the years as well as from observing people experiencing love. There are many versions of love – There are those who love their pets, etc, or in my case, love filmmaking and eating. And there are some things we love more than others. Of course, the most romantic and whimsical love is love for your significant other. One of the many things I realize is that no one is perfect and love needs a lot of work from the parties involved. The greatest thing about love is that it can inspire you. In the short film, the characters search deep within to discover themselves once they start to fall in love. They become stronger and are inspired to make sacrifices. Just like in real life, the choices you make when in love will form your life story. That sort of interaction between two lovers makes me enjoy watching and writing stories on love. What were the easiest and most challenging aspects of making this film? Were there any memorable experiences that you’d like to share? As compared to my past short film productions, the easiest thing in making this is getting the participation of the wonderful cast and crew that I wanted to work with. They had no hesitation in being part of this production. I am grateful that they believed in my story and me. Without their contributions, the story will never be what it is today. It has been such a joy working with them. I think, once people understand what you represent, your style and type of stories you write, and they like it, they will be very willing to be part of your production. There are 4 main ‘filming styles’ that I wanted to emulate in the story – Korean, Bollywood, French and Malay TV Drama. So the most challenging part in this production is to make each scene unique and distinct from the other as well as believable to those familiar with these styles. I identified several elements that are required to work well together to achieve this - wardrobe, dialogue and location. It took the art department and make-up artist 1-2 months to research for the right look, outfit and location for each scene. The make-up artist started watching bollywood movies and got hooked to the stories. Hehehe. It is tough for the art department because without a studio set, it is difficult to find a public place that does not look like Singapore. Try as we might, there are some scenes that showed SBS buses in the background even though it was supposed to be a Korean scene. We did enjoy spraying fake snow on the actors. The other greatest challenge is to create the fake yet believable accents, especially the Korean one. Truthfully, I did not know what I wanted. I only told the actors that I wanted something close to the original language as possible. All the dialogues were in English so they had to suggest something to me. Thankfully, the actors deeply researched on the linguistic intonations and how words are spoken in each language and the ideas they gave were amazing! The accents sounded familiar yet the foundation is basically made up of English words. Instead of them following the script, I had to closely study what the actors are saying in post production and while making the subtitles! Our script rehearsal sessions at Dhoby Gaut were definitely memorable. This idea of cultural and language fusion also allowed us to be creative and compose an OST. Featuring local musicians, it was fun to make and certainly an experience to compose a song that has a mix of Malay and English lyrics. Do you look at "love" differently after the completion of the film? How so? My perception on love has always been the same. I also accept that people have different understanding of love and their experiences on love are also different. There are also many elements and circumstances that can affect love. Today, one can be ready to accept love but tomorrow he/she will not be willing to fall in love. What do you hope viewers take away after the end credits roll? Why do you think this short film is worthy of more people’s attention? I want the audience to enjoy the story. 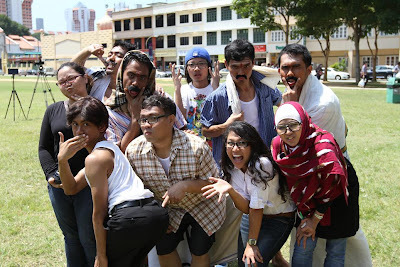 Hopefully, they can find laughter in the different styles shown in the short film and feel nostalgic. At the same time, falling in love is not easy. We need to constantly discover ourselves and sacrifices, no matter how small they are, might be made. Also, the decisions we make in any circumstances will form our life story. I feel that my short film is unique because it has never been told in this way before (4 filming styles). Also, it is a story that Singaporeans can relate to. It is light-hearted and enjoyable yet it also touches on serious issues like a person’s mental well being, journey of self discovery and topics relating to love. Do you foresee yourself making more films about "love"? What’s next in your filmmaking journey? Yes! As I mentioned before, there are many different types of love. There are many stories that can be told about love. Together with love, there is also hope and sadness. I prefer this to, say, horror movies or stories about angst because I want my stories to inspire people. I also love underdog stories. At the moment, nothing is concrete but I would love to continue making stories that can inspire people, be it short films or features. I really hope that my journey will bring me to meet more creative people and those who share the same passion as me. I want to make more friends. I want to learn from those who have vast experience in this line so I can improve and continue to work with those who believe in my story and me.